I am not a collector of Energy drinks, but saw these 2 in the store and picked them up. They are the first aluminum cans I have ever seen that are wrapped instead of painted. 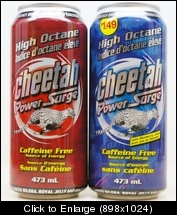 If anybody wants any energy drink cans from Canada, I will trade for Coca Cola cans. Just let me know what you are looking for. There are many brands here, but I am not sure which ones if any, are available only in Canada. I rellay would like to do trade with you.